According to Feeding America, over 40 million people are struggling with hunger. This number includes 12 million children. Often these families have to make a choice between keeping the lights on or feeding their family, or paying a medical bill or buying food. Throughout the year and especially during September – Hunger Action Month – Heartland Alliance provides supports for those who are hungry. Laura Ritland Samnadda, Heartland Alliance Health’s Food and Nutrition Manager, has dedicated her career to helping others escape the daily crisis of food insecurity. Over the past three decades, one of Heartland Alliance’s primary goals has been to end hunger for as many individuals as possible – helping people achieve not only their health and nutrition goals, but achieving overall life goals as well. To increase healthy food and nutrition options for participants, we employ a team of traveling dietitians that provide community-wide cooking classes, as well as partner with agencies like the Greater Chicago Food Depository and Heartland Human Care Service’s FarmWorks urban farm. Additionally, we have an advocacy team who promotes stronger food assistance programs, and a city-wide system of food pantries, known as Vital Bridges, dedicated to serving some of the most at-risk populations. 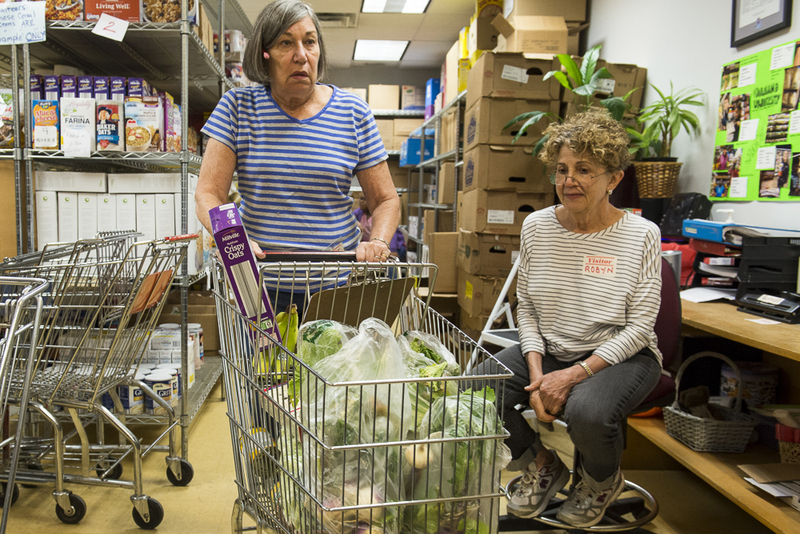 Vital Bridges is a participant choice site – meaning that the pantries don’t want to have people walk away with food they aren’t going to use. We are especially focused on creating a welcoming atmosphere for those who need our services, so that visitors are encouraged by the options provided. Heartland Alliance Health Community Dietician Elizabeth Murphy believes strongly in that approach. According to the National Education Association, hungry children have lower math scores, and are more likely to repeat a grade, come to school late, or miss it entirely. These adverse experiences can compound and if hunger continues to ensue, the likelihood of escaping poverty decreases. 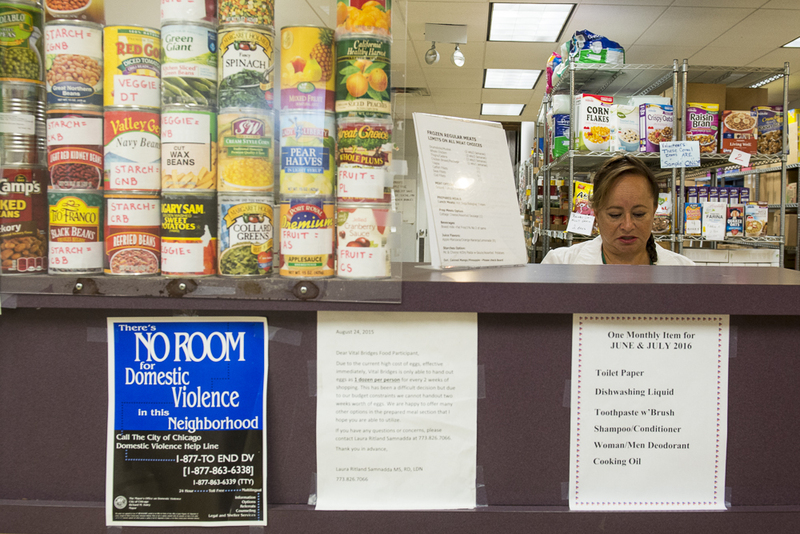 According Bertha Segura De Gonzalez, coordinator for the Vital Bridges food pantries, the question of who eats in a household is a question asked far too often. Shopping in our pantries is only the first step to healthier outcomes. Our staff are quick to work together to provide more access to supports for the participant. Oftentimes, we are able to connect them with other Heartland Alliance programming – using our housing, healthcare, or employment services to help them find safety and stability. At Heartland Alliance, we prefer to focus on the “action” part of Hunger Action Month and according to Samnadda, there are many ways for all of us to take a stand for those who are food insecure. Supporters also can join us as we near our annual Harvest for Hope food drive. This year, our food and nutrition team is especially in need of financial support. As we strive to continue providing choice and flexibility for our participants, funds raised allow the staff to buy food and personal care items for specific individuals and families as needed. Please click here or contact Celeste Johnson for more information – (312) 660-1390, cejohnson@heartlandalliance.org.